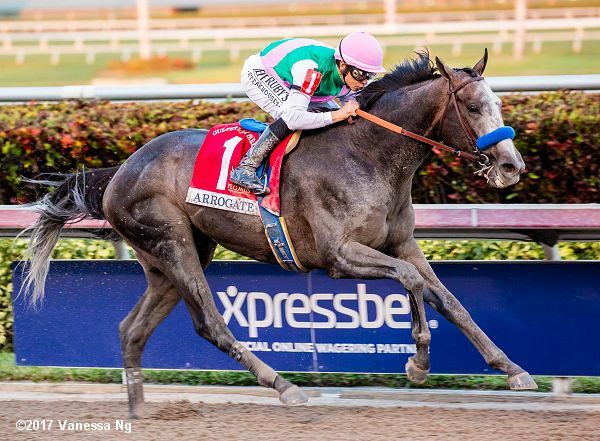 ARROGATE is the new King. The grey freak is just that; he pokes along in the post parade, calm, cool and collected but is a true superstar racehorse on the track. His jaw-dropping win the Pegasus World Cup, the $12 million race run for the first time yesterday at Gulfstream, was both stirring for fans and horsepeople and yet just as flabbergasting was CALIFORNIA CHROME’S 29 1/2 length drubbing, leaving the crowd stunned as the horse flew past the finish. Later, it was revealed California Chrome was a bit off on the jog and had some fluid in a knee. This morning, he was sound on the walk, a bit off on the jog but he is scheduled to head to Kentucky shortly to Taylor Made Farm. 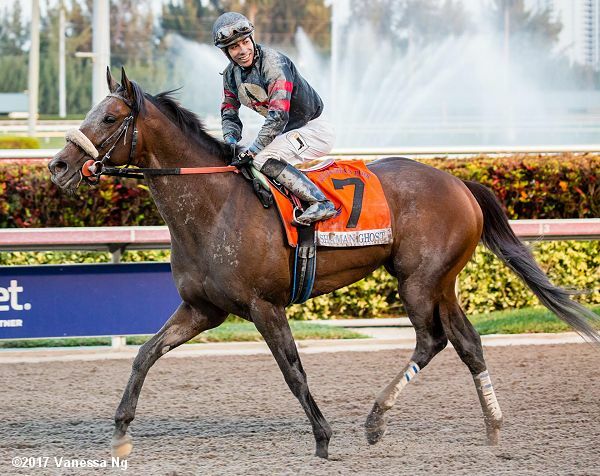 He is a 6-year-old who gave us thrills for many years – Kentucky Derby, Preakness, Dubai World Cup and more. He earned over $14 million and came from a humble breeding of obscure mare and stallion. He retired with a record of 27-16-4 -1. The wagering on the Pegasus card was expected to be a record and it was, $40 million, bettering $32 million for a previous high at Gulfstream. The view of Pegasus from Australia.. The son of UNbridled’s Song is from the family of the brilliant MEADOW STAR (his 3rd dam). Meadow Star was one of the greatest fillies of her time, a champion 2yo and she won 6 grade 1’s and 11 of 20 races. However, she was not much of a producer, 4 winning foals. One was stakes placed GRECHELLE, the dam of stakes winner BUBBLER. Bubbler was offered for sale at Keeneland November last year and was bought back for $4,7 million. Awesome Again, Victory Gallop, Chief Bearhart, Sky Classic, Dance Smartly. The Ghostzapper 5-year-old, grandson of Awesome Again, is now 6th on the list of all-time leading Canadian-bred horses. His dam is the #350K earner and stakes winner GETBACK TIME, a California-bred chestnut mare by Gilded Time. Getback Time has had 2 other runners, both minor winners and she had a 2014 Awesome again colt and was sold for $42,000 in foal to Point of Entry in 2014 (Kee Nov) to Arindel Farm. She had a Point of Entry colt in 2015.